Less than 1 hour from Greenville SC is Mountain Rest SC. This area has 4 private lakes: Chattooga Lake, Lake Becky, Mountain Rest Lake and Crystal Lake. Each of these lakes are man made. 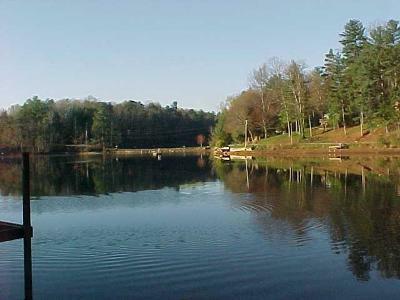 Chattooga Lake is 42 acres, gated and surrounded by National Forest. Chattooga Lake is restricted to homes. This lake was built by my father in law in the 50's so homes here date from the 50's to ones under construction now. Lake Becky is the larges lake at Mountain Rest with 92 acres. Lake Becky Subdivision joins national forest and the Oconee State Park. This lake has the least amount of building restrictions of any of the Mountain Rest Lakes. Mountain Rest Lake is 38 Acres and still allows jet skis. Mountain Rest Lake joins national forest and is one of the last private areas before you get to the Georgia line driving up Highway 28. Crystal Lake is a 30 acre private lake. Ben Vissage (the developer's son) was the first person in Mountain Rest to do bare-foot skiing. This lake has a 30' green space between most of the properties and the lake. Crystal Lake is the warmest lake at Mountain Rest. When you are ready to buy your mountain get away consider waterfront. These lakes are very affordable and each of the lakes have their own flavor so finding something to meet your desires is easier in Mountain Rest. Fishing is great and you will have a sense of community with each of these. Over time they have become a great investment, as you receive enjoyment and protect your investment value. Come visit our mountain lake communities, the private hidden jewels.